Gosh only 15 sleeps to go how exciting! Here is the next entry to my Countdown its from Ann and Shiner,isn't Shiner Gorgeous in this one? This is another Favourite...trouble is all the entries are pawsome and I know there will be many more to choose from,it's going to be a tough job! Anyway you have till Midnight on Christmas Eve UK time to get your photos of your decorations and trees with you in them if possible ,so send them to my mummy at [email protected] .Don't forget my Favourite 3 will get a surprise Christmas gift after the main event. A bunny for the Tree it has pride of place on the tree in the Kitchen,isn't it beautiful? Oh my gosh... That bunny ornament is just the cutest. ADORABLE! Absolutely adorable, for sure. What a cute doggy! ;) hehe... I absolutely love that bunny ornament too. It's gorgeous! The tree and the decorations are wonderful...and so is Shiner! Oh Speedy, all these beautiful trees, who knew there could be so many lovely ones ! Ana's tree is charming absolutely charming. 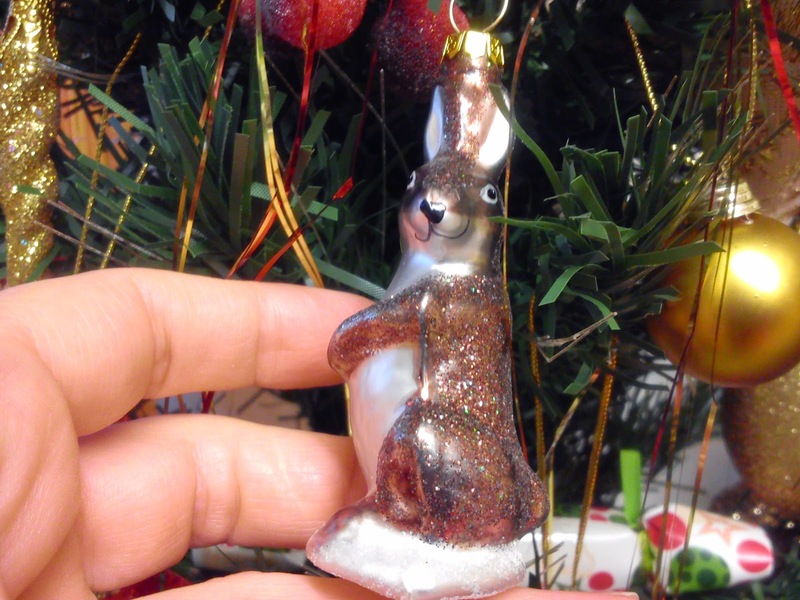 Loe your little rabbit ornament Speedy. Have a wonderful Wednesday. Shiner is for SURE good lookin. 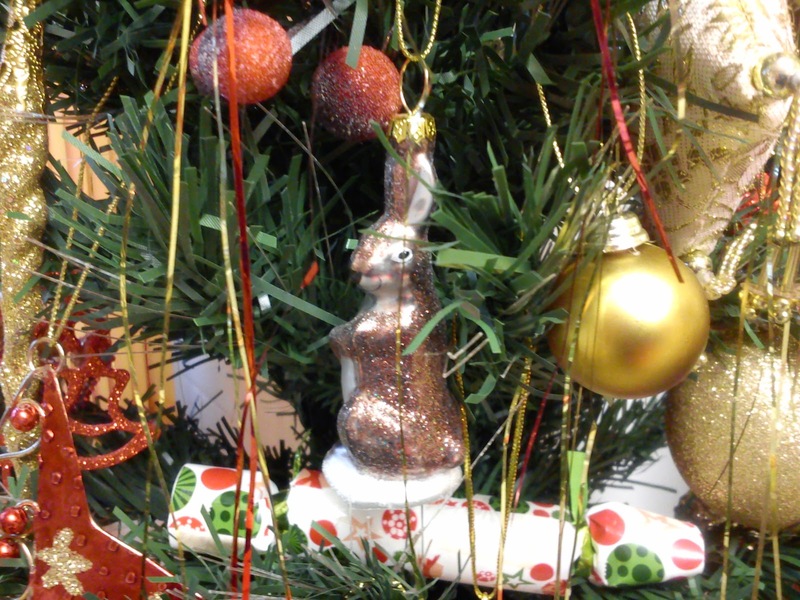 OMD we love the BUNNY Ornie for the Kitchen Tree. THAT is grand. Speedy we've been away for FAR too long - we love your background paper! I bet his little tummy's cold though wouldn't you think? :) Love the little rabbit ornament! dood...thiz bee like day ja view ore sum thin !! we just lefted shinerz houz....N we just said what a awesum tree her had N what a grate job decoratin it !! Shiner is one handsome dog! I adore your bunny ornament...it is lovely too. Oh! Look at the cuteness here today! Love this doggy and that bunny ornie! Sir Speedy and mummy, thank you so much for the Linkedin card! I tried to send one back, but was unable to enter! MANY HUGS and thanks for thinking of me. HUGS and yes, 15 more sleeps until the big day! That is a lovely tree. Your bunny ornament is adorable. What a sweet photo. Everyone's are so nice. Love your bunny ornament. WOW...a bunny ornament...say is that a relative of yours,,,, cause it's a cute as you Speedy! Shiner! I know that furry face anywhere!!!! Beautiful photos! We just love that photo at the top of your bloggy. It's so very cute. Such pretty ornaments too. Isn't Christmas fun? Oh, we entered your contest too and sent you an email. and photo. We love Shiner in front of his tree. SHINER is such a good name for him. haha...what a cutie!